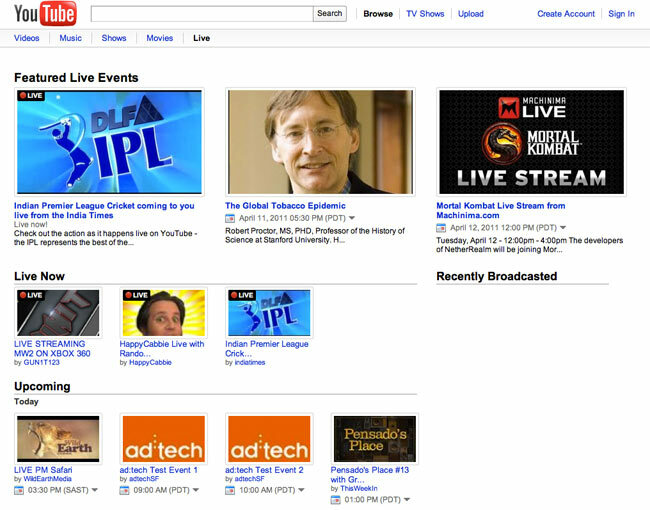 YouTube has now officially launched its new YouTube Live service which bring, as it states “Live” feeds to the sites services. The dedicated channel brings a new level of entertainment to the already huge video streaming site and will provide users with feature recommendation and discovery tools based on users’ viewing habits. Google has been testing the new service since September last year and YouTube has already been put through it paces with live streamed events like sports games and concerts. Upcoming live events will be listed on the site front page and also offers the ability to subscribe to streams from content partners. Google is also starting rolling out its live streaming platform so that other content makers can then join the live streaming service. The new officially launched YouTube Live is now available to view at youtube.com/live and the new addition will provide Ustream and Justin.tv with a little more competition.